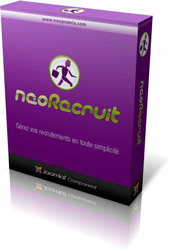 The NeoRecruit component is now available in version 3.1.3. This new release corrects some minor bugs and also improves some of the features of the component, including controls on the forms on client side. Correction on updating applications in front (when adding a comment or updating the application status). Update of the applications update process in order to only send the notification email when the status is modified. If you have any question about this new release, about one of the new features, or about the upgrade process, feel free to use the Contact form ! For more information about the component, you can also visit the NeoRecruit component page.